25 January 2019 — We, the undersigned organisations, strongly condemn Donald Trump administration for its support for an on-going coup attempt in Venezuela. The US administration under Donald Trump has declared its recognition for Venezuelan opposition leader Juan Guaido as “interim president” in its latest coup attempt to overthrow the democratically elected government of President Nicolas Maduro. The Washington and its allies in Lima Group, had refused to recognize Maduro as the elected President of Venezuela, instead declared their support for the unelected and illegitimate “interim president”. The imperialist US and its allies have no interest in defending the democratic rights of the Venezuelan people, but have demonstrated their eagerness to reverse all the social gains of Bolivarian Revolution in Venezuela for the last 20 years. The current events in Venezuela is possibly to use as an excuse for more economic sanctions and even military interventions by the US in the country. We should not forget how the imperialist US engineered the military coup in Chile in 1973 against the democratically elected Salvador Allende and installed the brutal Pinochet dictatorship. We should not allow this to be happened again! We call upon our governments and International community to denounce the action by the US and its allies in recognizing an illegitimate president in Venezuela. We stand together and express our solidarity with the people of Venezuela in the struggle to resist imperialist intervention and to defend its democratic sovereignty. January 24, 2019 — The Socialist Alliance strongly condemns the actions of the United States President Donald Trump in backing an attempted coup against the democratically elected government of Venezuela. In an act of contempt for Venezuela's legal system and a violation of its constitution, opposition leader Juan Guaido swore himself in as Interim President on January 23 - and immediately received the backing of US President Donald Trump and the Organisation of American States (OAS) for this illegitimate act. Responding to this, Venezuelan President Nicolas Maduro announced on January 23 that Venezuela was cutting diplomatic ties with Washington and ordered all diplomatic staff to leave the country within 72 hours. The US State Department is refusing to recognise the legitimacy of President Maduro and vowing to continue diplomatic relations via Guaido and to take "appropriate action" to defend its mission. This declaration is being widely understood as a pretext to possible military intervention. The Venezuelan armed forces have declared their support for the Maduro government and have vowed to defend the constitution and national sovereignity. Is the US government interested in helping the people of Venezuela? If they were, they would lift the economic sanctions they have imposed on Venezuela since 2015 and which escalated in 2018 under Donald Trump. At the heart of the US aggression is an attempt to reverse the gains of the Bolivarian revolution, which has promoted popular power and delivered social gains throughout the country over the past 20 years. These are gains that the Venezuelan people will defend. The Socialist Alliance stands with the people of Venezuela against this grave attack on their sovereignty. We call on the Australian government to recognise Nicolas Maduro as the legitimately elected president of Venezuela and to condemn the US-backed attempted coup. PSM statement on US coup attempt in Venezuela: Hands off Venezuela NOW! 24 January 2019 — Socialist Party of Malaysia (PSM) strongly condemns Donald Trump administration for its support for an on-going coup attempt in Venezuela. The US administration under Donald Trump has declared its recognition for Venezuelan opposition leader Juan Guaido as “interim president” in its latest coup attempt to overthrow the democratically elected government of President Nicolas Maduro. The Washington and its allies in Lima Group, had refused to recognize Maduro as the elected President of Venezuela, instead declared their support for the unelected and illegitimate “interim president”. The imperialist US and its allies have no interest in defending the democratic rights of the Venezuelan people, but have demonstrated their eagerness to roll back all the social gains of Bolivarian Revolution in Venezuela for the last 20 years. The current events in Venezuela is possible to unveil the threat of military aggression by the US in the country. We should not forget how the imperialist US engineered the military coup in Chile in 1973 against the democratically elected Salvador Allende and installed the brutal Pinochet dictatorship. We should not allow this to happen again! We call upon the International community to denounce the action by the US and Lima Group in recognizing an illegitimate president in Venezuela. January 24, 2019 — Philippines-Venezuela Solidarity stands unequivocally with the Venezuelan people, and their democratically elected government and president, against the unfolding coup attempt being orchestrated in Washington and against the growing threat of US invasion. The situation in Venezuela is becoming more dangerous by the moment, as the US government is stepping up its efforts to overthrow the democratically elected Venezuelan president, the socialist Nicolas Maduro. Following a week of provocations and terrorist attacks by US-backed opposition elements, on January 23 the US and its allies in the Lima Group recognised little-known opposition politician Juan Guaidó as president. With the Venezuelan armed forces pledging loyalty to the constitution and to the elected government, it appears that the coup is faltering. However, the belligerent rhetoric from US Trump administration leaders has only escalated, explicitly threatening, and inventing pretexts for, direct US military aggression against Venezuela. While thousands of Venezuelans have taken to the streets to support the legitimately elected government — and the continuation of the Bolivarian Revolution that began after the election to the presidency of Hugo Chavez in 1998, much smaller numbers of opposition supporters have also taken to the streets to indulge in violence and vandalism. The US has opposed the Bolivarian Revolution since the outset. Previous attempts to overthrow the Venezuelan government include the 2002 coup d’etat against Chavez that was defeated by a massive popular mobilisation. Since 2014, some support for the Bolivarian Revolution has been undermined by an economic crisis that has undone much of the rise in living standards that the revolution brought about. However, this crisis is largely the result of crippling US-led economic sanctions and this is widely understood in Venezuela. 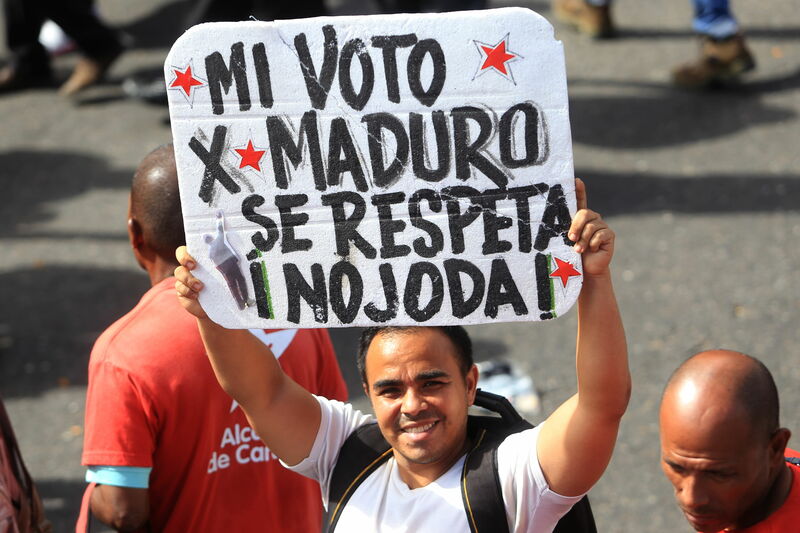 Maduro has continued winning elections. The decision by the US to recognise Guaidó as president, in defiance of international law and the basic norms of diplomacy, has been echoed by the governments of Argentina, Brazil, Canada, Chile, Colombia, Costa Rica, Ecuador, Peru and other US allies in the region. Belize, Bolivia, Cuba, Mexico and Nicaragua are among the countries in the region supporting Venezuela. In a display of utter hypocrisy, the US and its allies are using the rhetoric of democracy, rule of law and human rights to justify removing the democratically elected president of Venezuela and install someone who did not even stand in the presidential elections. However, this hypocrisy is perhaps not surprising given the centuries long history of violent and criminal aggression by US imperialism in the Americas and the current administration of Donald Trump plumbing new depths in criminality, racist authoritarianism and a foreign policy based on imperialist arrogance and xenophobic contempt. The recently elected right-wing president of Brazil, Jair Bolsonaro, has been one of the loudest voices supporting the US plans for regime change in Venezuela. Bolsonaro’s attempts to question the legitimacy of Maduro’s election are particularly ironic given that his own electoral victory followed a judicial coup d’etat against former President Dilma Rousseff, the legally dubious trial and imprisonment of the most popular candidate, Lula da Silva, and voter intimidation by elements in the police and armed forces, and Bolsonaro’s own goons. Bolsonaro’s domestic agenda, which has been described as fascist, literally threatens genocide against Indigenous people, the LGBTI and violent repression against environmentalists, feminists and the left. Another regional government to have come out strongly in support of the US aggression is that of Colombia. This government has shown its disregard for democracy and human rights with assassinations of former guerrillas who disarmed under a peace deal. It is possible that if the coup attempt continues to fail, Colombian and Brazilian troops will provide the ground force for a US-led invasion. Following the expulsion of US diplomats from Venezuela, the US State Department said on January 23: “The United States does not recognize the Maduro regime as the government of Venezuela. Accordingly the United States does not consider former president Nicolas Maduro to have the legal authority to break diplomatic relations with the United States or to declare our diplomats persona non grata.” This is clearly an attempt to create a pretext for war. Urgent international solidarity is needed to support the legitimately elected government of President Nicolas Maduro and to defend the Bolivarian revolution against the US-led coup and possible military intervention.